First in a series of posts to come about my trip to Tauranga this past weekend, attending the conference and AGM for the NZ Federation of Historical Societies (I was delegate for Avondale-Waterview HS, and I'm on the NZ Fed committee). I didn't attend three out of the four lectures during the conference, though -- I decided to go wandering in the town, following the heritage trail. 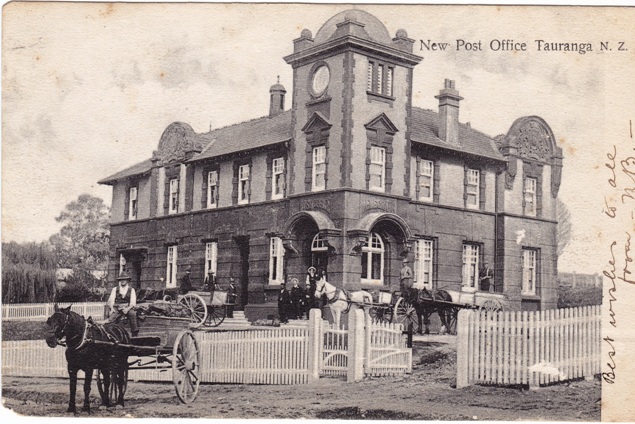 Tauranga's second post office (the first burned down in November 1902) was completed in 1906, which would be the year the above postcard shot was taken, as the clock face in the tower is still blank. They finally installed the clock in January 1907. And here it is today -- extended along Willow Street frontage (left). It's a bit of a climb up those stairs. This is the first view you see on the walk. For a moment, I wondered if it was the post office. Six months ago the work of raising a new post office was begun. Assailed because of their indifference to the North, the Government apparently decided to spend money lavishly on this new building, saying, as it were, "Just look what we are doing at Tauranga, and for ever more be silent." But "donors" have more ways than one of making gifts. Now that the Tauranga post office is outwardly completed, those who believe that again things are not precisely what they should be have abundant justification for their belief. Without attempting to criticise the weird type of architecture displayed — if it is a type — it will here suffice to briefly allude to the position of the new building. One fact immediately strikes the observer, namely, that the back, not the front, is turned towards the town, and that the most ornamented position has been made to face a dead, solid wall of brown earth, nearly as high as itself. To explain: the steep ground which rises behind the business part of the town has been excavated to provide standing room for the post office. On the west and north sides are the straight, red, earthen walls of the hill, varying from about 10ft to 50ft in height. On the west side of the building, that facing the wall of earth, a handsome porch and doorway now stand revealed to those who care to explore; on the north side, also facing the dull earthen wall and looking away from the town, are decorated windows and doorways, scroll work, dates, monogram, and the legend "Telegraph Office." No stranger will over climb up that particular part of the eminence to look for the telegraph or any other office. And then the tower and the clock! The tower stands at the faraway end, and the clock cannot possibly be seen from any part of the business portion of the town. Said clock looks down on the top of the decayed Mechanics' Institute, on the top of the so-called Theatre Royal, on several dilapidated and empty houses, and on the butcher's paddock, which, after working hours, contains two horses. That portion of the building which is most visible to the town, which stands out prominent above the roadway, is the back. The decorations modestly hide themselves— like other good works of the donors -- but the bare black rear, with its unsightly pyramid of red water tanks, faces unabashed the town below. Seeing some of the Willow Street facade reassured me I was on the right track. Tauranga is to have a new Post Office costing £4500. The agitation set on foot in 1897 by means of a competition promoted by this journal, to establish a Town Clock in Tauranga, to be set up in the Post Office, though not dead, has been asleep for now eight years, but is we are glad to say reviving, with the sight of the new Post Office buildings now in course of erection. The cost of such a clock, may of course vary immensely according to the means and wishes of the buyers, but from information handed to us by Messrs Mann and Co, of this town, we gather that a suitable timepiece, with say, a dial 8 feet in diameter, and a bell capable of being heard when striking the hours, at a distance of from half a mile to a mile, according to weather and other conditions, can be purchased in London at a cost of from £58 1 0s to £75. The roofing of the new Post Office with red Marseilles tiles, crested ridging and terracotta finials, is now completed, and the plasterers are now engaged outside putting on the finishing coats of coloured cement compo, the two colours used in the upper portion being dark red and yellow ochre, the former for the entablature, quoins, mouldings, etc , and the latter for the plane surfaces, which are rough cast with gravel. The whole promises to present a very striking appearance when finished. The new Post Office is to be enclosed with a substantial fence all round on the boundaries of the allotment on which it stands, with double gates at the carriage entrance, and a wicket for pedestrians. If the Department, or the Borough authorities, with its sanction, will utilise the bank in front and below the building for planting small flowering shrubs, it will greatly enhance the appearance of the building and be an ornament to the town. Undoubtedly something will have to be done to keep the grass and weeds down, when the Borough cows are prevented from acting as municipal landscape gardeners, and the expense might as well be directed into ornamental as well as useful channels, instead of merely utilitarian ones. The clock tower is probably the most striking (excuse the pun) part of the building's ornate Edwardian architecture. During the last two days there has been a general clearing up at the new Post Office, where work is now almost completed except the painting and decorating. The former will take probably another week or two to complete, but some portions of the internal decorating will have to be put off for a few months, to allow the plaster mouldings, etc, time to thoroughly dry. In reply to a question by the Mayor about the opening of the new Post Office, the Minister [William Hall-Jones] said that this could not be done just yet as it was not complete, and in the case of a Post office an essential part of the ceremony was the posting of the first letter, which could not be done till everything was in working order. A final order for a turret clock and three hundred- weight bell for the new Post Office, was cabled Home on Friday last by Messrs Mann and Co., after consultation with the Mayor (Dr Brown), and Mr G. A. Ward, and it is expected that the a clock and bell will be ready for shipment a fortnight hence. The makers, Messrs Dent, of Westminster clock fame, thought it best to refer some matters for consideration, as owing to the great increase of price in metals, especially bell metal, which has gone up 70 per cent since the firm's tender of nine years ago, a suitable clock to strike on a 3cwt bell could not be landed under £112. This cost and the expenses of fixing of the clock in position will probably bring the fund in debt to about £10 or possibly £15; however the Clock Committee above named decided to order, feeling sure that even if the Government will not pay or subsidise the extra amount, the public of Tauranga will loyally support them in getting a really good article, which will reflect credit on the town. I looked for an official opening, by some Government Minister as is usually the case for these buildings at that period -- but somehow I think the opening was quite low-key. The building today, after a 1999 restoration, is registered category 1 by NZHPT. The site also includes two time capsules, due to be opened in 2099. Cheers, Liz. It's certainly a beauty.